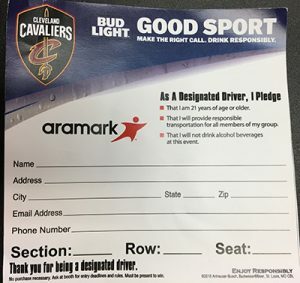 The Cleveland Cavaliers promote responsible drinking and positive fan behavior at Quicken Loans Arena. 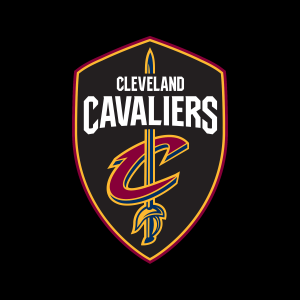 The Cavaliers Fan Code of Conduct and the details of the Cavs alcohol management plan that appear below ensure that fans have a safe and fun experience. Max Beer Size: 24 oz. Max Wine Size: 6.5 oz. TEAM Training is conducted at Quicken Loans Arena by Aramark. 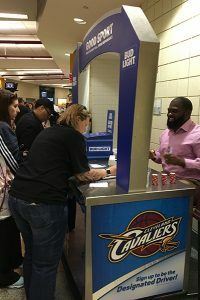 Aramark at Quicken Loans Arena has consistently won training awards from TEAM Coalition. The Cleveland Cavaliers offer fans the Bud Light Good Sport Designated Driver program at all Cavs games at Quicken Loans Arena. Fans who pledge receive a token to be redeemed at concessions for a free non-alcohol beverage. Fans who pledge are entered to win the Bud Light Good Sport of the Game prize drawing. Each game, one Good Sport wins a Cavs branded prize pack. Guests will be treated in a consistent, professional and courteous manner by all arena and team personnel, and will also be expected to conduct themselves in a way that is respectful to each other. Guests will enjoy the event experience free from disruptive behavior, including foul or abusive language or obscene gestures. Offensive messages on signs or clothing will not be permitted. Guests will not engage in fighting, throwing objects or attempting to enter restricted areas, including the court, ice or performance areas, and those who engage in any of these actions will immediately be ejected from the event. Quicken Loans Arena is a non-smoking facility. Guests will smoke in designated smoking areas only. Arena frontline representatives have been trained to intervene where necessary to help ensure that the above expectations are met, and guests are encouraged to report any inappropriate behavior to the nearest usher, security guard or guest services team member. Guests who choose not to adhere to these provisions will be subject to ejection without refund and revocation of season tickets and may also be in violation of city ordinances resulting in possible arrest and prosecution.